This month, the Chain Store Guide research team queried the Leading Chain Tenants database to look at the health-and-beauty vertical and came up with a couple of recommendations for readers and clients. 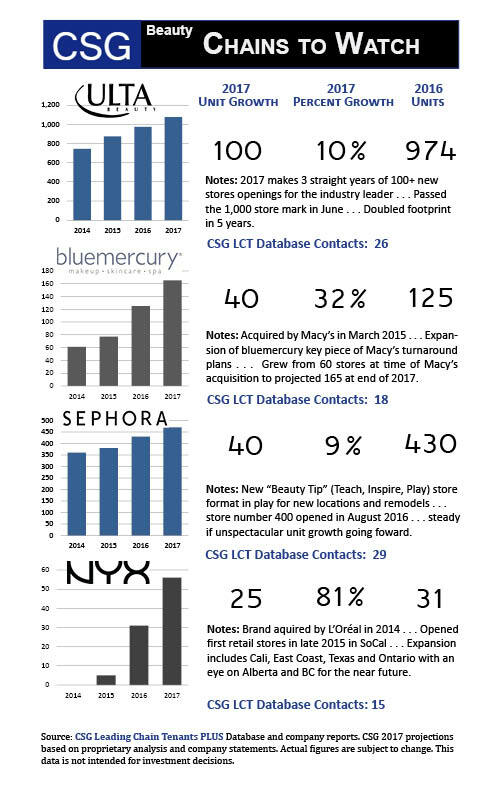 North America’s leading beauty retailer tops the list with a modest growth rate but a multi-year track record of adding 100+ new units annually. Also on the list are two hot, up-and-coming beauty brands, both recently acquired by parents with deep pockets ready to fuel store growth. And we round things out with a slow-but-steady mall-store staple that looks to add 40 or so units in the next 12 months. All of these organizations have one thing in common – a growing need for commercial real estate space.